Residents at DePaul’s North Chili Community Residence are finding solace and offering assistance at a H.O.R.S.E. Rescue and Sanctuary, a farm for horses that have been abused, neglected or abandoned. Residents regularly deliver shredded paper collected from several DePaul locations which is used for the horses’ bedding. When they are ready, residents will be trained to groom the horses, said DePaul Community Residence Manager Bernard O’Connor. “I feel a connection with the horses because they have overcome challenges the same way I have,” said North Chili resident Mike B.
Lauren Petrilli, a Residential Counselor at North Chili, helped start the visits to the horse farm, which is supported by volunteers and donations. Pictured here, residents Garrett F. and Mike B. are learning to work with the horses, which are rehabilitated and adopted out to new homes. Petrilli said working with the horses helps residents increase self-esteem and self-confidence as well as communication, leadership and trust skills. 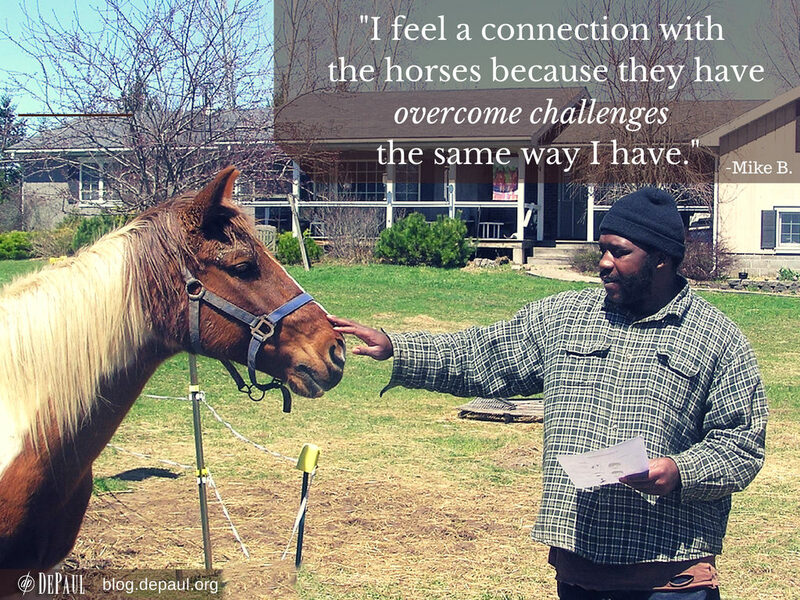 DePaul’s Mental Health programs, like our North Chili Community Residence, offer support, opportunity and hope for the people we serve. Learn more about DePaul’s quality care.